Not gonna lie -- I was pretty nervous about adapting this particular recipe for a couple of reasons. 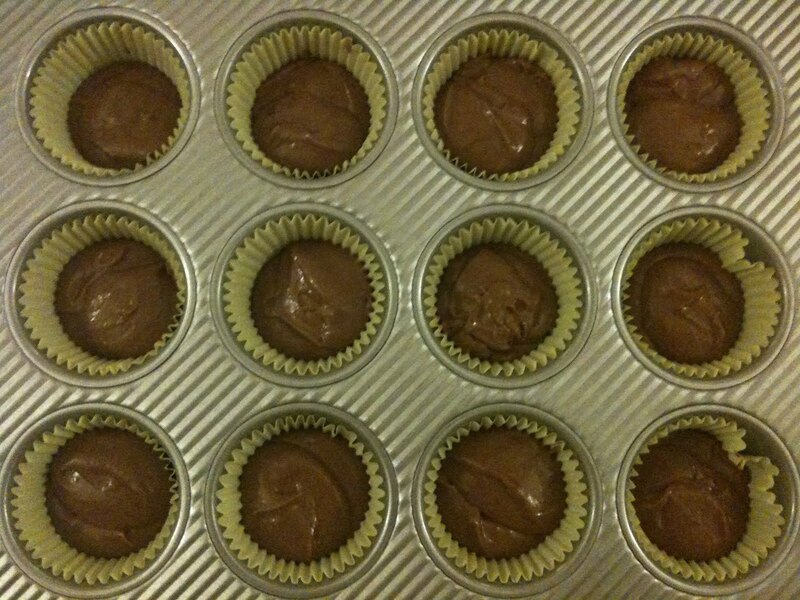 Aside from my reluctant dislike for chocolate cakes and cupcakes, I was nervous about using cocoa powder in high-altitude baking. I just don't know anything about it! Susan Purdy, author of the fairly comprehensive Pie in the Sky: Successful Baking at High Altitudes, makes no mention of cocoa powder's special properties and its function in the baking process in general. Besides flavoring the finished product, does cocoa powder have some sort of secret role that I'm unaware of? For instance, does the powder absorb more than its fair share of liquid in baking? If so, it could potentially dry out my cupcakes even more in Denver's higher altitude! What if it has some sort of leavening effect? If it does, that would be especially worrisome, since leavening agents tend to be the ingredients that screw everything up so badly! So with bated breath, I decided to do what I had done with the vanilla cupcakes recipe: run an initial control experiment. That is, what did the original, unaltered sea-level recipe produce at high altitude? Pretty standard, right? Looks like regular recipe batter at any altitude. An interesting thing to note is that, when compared with the Hummingbird Bakery's vanilla cupcakes recipe, this chocolate cupcake recipe requires an additional 2 tablespoons of flour and 2.5 tablespoons of cocoa powder. These additions yield enough batter to fill a full muffin tin's worth of batter. The vanilla recipe, in contrast, only yielded enough batter for 10. Wa-hey! Not bad! 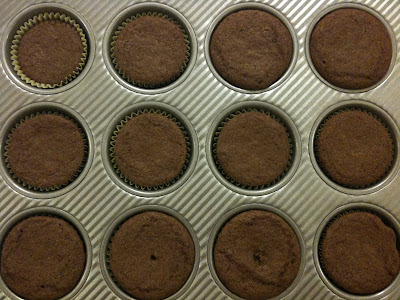 Certainly better than the first time I baked Hummingbird's recipe for vanilla cupcakes without changing a thing. Remember those puddles of goop? That's the kind of thing I was expecting with this first round. 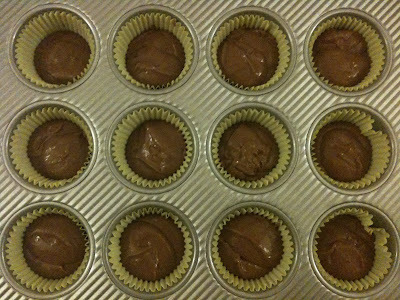 But instead, the chocolate cupcakes looked like a third or fourth attempt. 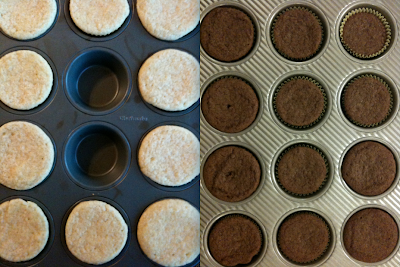 These are the unaltered chocolate cupcake results (right) compared with the un-altered vanilla cupcake results (left). Also, sorry for the grainy picture, I'm no good with Photoshop. And how did they taste? They were... fine. Better than fine. They actually even tasted like a fourth attempt -- a little sticky, a little gummy, and missing that signature Hummingbird crumb/substantial texture, but definitely getting there. 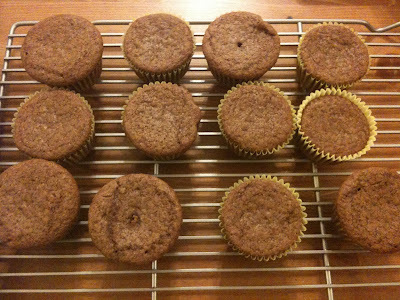 The stickiness might have been a result of being undercooked, as had been the case for the Hummingbird vanilla cupcakes. After all, when I initially opened the oven at 20 minutes (the recipe calls for a bake time of 20-25 minutes), the toothpick inserted into the cake's center still picked up some cake (indicating that it was undercooked). 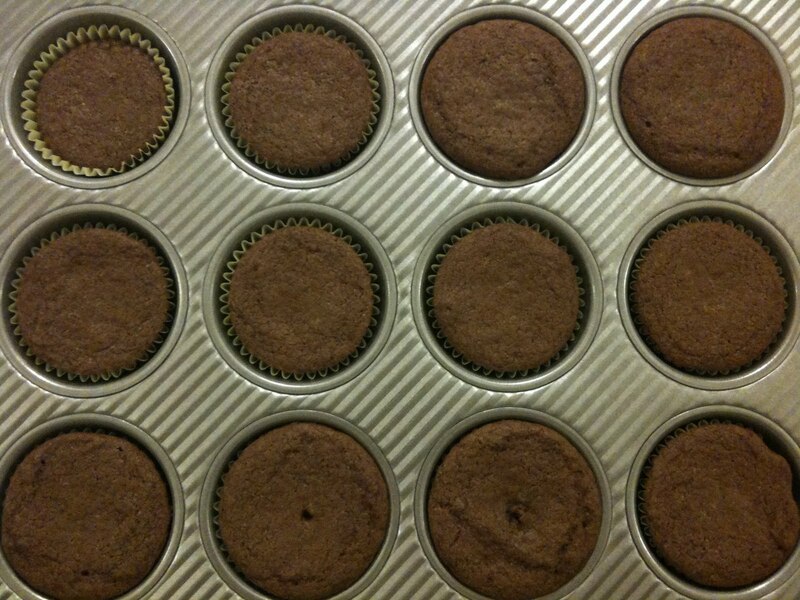 However, when I re-tested the cakes after the full 25 minutes, they were ready to go. All things considered, this was not a bad start to the experiment -- especially when compared to the vanilla cupcakes! It just goes to show that each recipe really is unique, and each sea-level recipe requires its own unique set of fine-tuning and calibration. As a high-altitude baker, you really cannot rely on just one set of generic rules when attempting to adapt recipes for higher altitudes. But I'm optimistic about this one, guys. For once. Really.